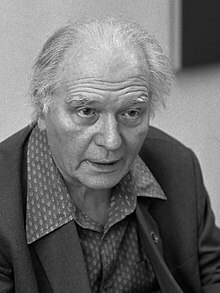 Olivier Eugène Prosper Charles Messiaen (French: [ɔlivje mɛsjɑ̃]; December 10, 1908 – April 27, 1992) was a French composer, organist, and ornithologist, one of the major composers of the 20th century. His music is rhythmically complex; harmonically and melodically he employs a system he called modes of limited transposition, which he abstracted from the systems of material generated by his early compositions and improvisations. He wrote music for chamber ensembles and orchestra, vocal music, as well as for solo organ and piano, and also experimented with the use of novel electronic instruments developed in Europe during his lifetime. Messiaen entered the Paris Conservatoire at the age of 11 and was taught by Paul Dukas, Maurice Emmanuel, Charles-Marie Widor and Marcel Dupré, among others. He was appointed organist at the Église de la Sainte-Trinité, Paris, in 1931, a post held until his death. He taught at the Schola Cantorum de Paris during the 1930s. On the fall of France in 1940, Messiaen was made a prisoner of war, during which time he composed his Quatuor pour la fin du temps ("Quartet for the end of time") for the four available instruments—piano, violin, cello and clarinet. The piece was first performed by Messiaen and fellow prisoners for an audience of inmates and prison guards. He was appointed professor of harmony soon after his release in 1941, and professor of composition in 1966 at the Paris Conservatoire, positions he held until his retirement in 1978. His many distinguished pupils included George Benjamin, Alexander Goehr, Pierre Boulez, Karlheinz Stockhausen, and Yvonne Loriod, who became his second wife. He found birdsong fascinating, notating bird songs worldwide and incorporating birdsong transcriptions into his music. His innovative use of colour, his conception of the relationship between time and music, and his use of birdsong are among the features that make Messiaen's music distinctive. Olivier-Eugène-Prosper-Charles Messiaen was born on December 10 in 1908 at Avignon, France, into a literary family. He was the elder of two sons of Cécile Sauvage, a poet, and Pierre Messiaen, a teacher of English from a farm near Wervicq-Sud who translated the plays of William Shakespeare into French. Messiaen's mother published a sequence of poems, L'âme en bourgeon ("The Budding Soul"), the last chapter of Tandis que la terre tourne ("As the Earth Turns"), which address her unborn son. Messiaen later said this sequence of poems influenced him deeply and he cited it as prophetic of his future artistic career. At the outbreak of World War I, Pierre Messiaen enlisted and Cécile took their two boys to live with her brother in Grenoble. There Messiaen became fascinated with drama, reciting Shakespeare to his brother with the help of a home-made toy theatre with translucent backdrops made from old cellophane wrappers. At this time he also adopted the Roman Catholic faith. Later, Messiaen felt most at home in the Alps of the Dauphiné, where he had a house built south of Grenoble where he composed most of his music. He took piano lessons having already taught himself to play. His interest included the recent music of French composers Claude Debussy and Maurice Ravel, and he asked for opera vocal scores for Christmas presents. He also saved to buy scores and one such was Edvard Grieg's Peer Gynt whose “beautiful Norwegian melodic lines with the taste of folk song...gave me a love of melody.” Around this time he began to compose. In 1918 his father returned from the war and the family moved to Nantes. He continued music lessons; one of his teachers, Jehan de Gibon, gave him a score of Debussy's opera Pelléas et Mélisande, which Messiaen described as "a thunderbolt" and "probably the most decisive influence on me". The following year Pierre Messiaen gained a teaching post in Paris. Messiaen entered the Paris Conservatoire in 1919, aged 11. At the Conservatoire, Messiaen made excellent academic progress. In 1924, aged 15, he was awarded second prize in harmony, having been taught in that subject by professor Jean Gallon. In 1925 he won first prize in piano accompaniment, and in 1926 he gained first prize in fugue. After studying with Maurice Emmanuel, he was awarded second prize for the history of music in 1928. Emmanuel's example engendered an interest in ancient Greek rhythms and exotic modes. After showing improvisational skills on the piano Messiaen studied organ with Marcel Dupré. Messiaen gained first prize in organ playing and improvisation in 1929. After a year studying composition with Charles-Marie Widor, in autumn 1927 he entered the class of the newly appointed Paul Dukas. Messiaen's mother died of tuberculosis shortly before the class began. Despite his grief, he resumed his studies, and in 1930 Messiaen won first prize in composition. While a student he composed his first published works—his eight Préludes for piano (the earlier Le banquet céleste was published subsequently). These exhibit Messiaen's use of his modes of limited transposition and palindromic rhythms (Messiaen called these non-retrogradable rhythms). His public début came in 1931 with his orchestral suite Les offrandes oubliées. That year he first heard a gamelan group, sparking his interest in the use of tuned percussion. In the autumn of 1927, Messiaen joined Dupré's organ course. Dupré later wrote that Messiaen, having never seen an organ console, sat quietly for an hour while Dupré explained and demonstrated the instrument, and then came back a week later to play Johann Sebastian Bach's Fantasia in C minor to an impressive standard. From 1929, Messiaen regularly deputised at the Église de la Sainte-Trinité, Paris, for the organist Charles Quef, who was ill at the time. The post became vacant in 1931 when Quef died, and Dupré, Charles Tournemire and Widor among others supported Messiaen's candidacy. His formal application included a letter of recommendation from Widor. The appointment was confirmed in 1931, and he remained the organist at the church for more than sixty years. He also assumed a post at the Schola Cantorum de Paris in the early 1930s. In 1932, he composed the Apparition de l'église éternelle for organ. He married the violinist and composer Claire Delbos also in 1932. Their marriage inspired him to both compose works for her to play (Thème et variations for violin and piano in the year they were married) and to write pieces to celebrate their domestic happiness, including the song cycle Poèmes pour Mi in 1936, which he orchestrated in 1937. Mi was Messiaen's affectionate nickname for his wife. In 1937 their son Pascal was born. The marriage turned to tragedy when Delbos lost her memory after an operation towards the end of World War II. She spent the rest of her life in mental institutions. In 1936, along with André Jolivet, Daniel-Lesur and Yves Baudrier, Messiaen formed the group La jeune France ("Young France"). Their manifesto implicitly attacked the frivolity predominant in contemporary Parisian music and rejected Jean Cocteau's 1918 Le coq et l'arlequin in favour of a "living music, having the impetus of sincerity, generosity and artistic conscientiousness". Messiaen's career soon departed from this polemical phase. listen (help·info)). He also wrote the extensive cycles La Nativité du Seigneur ("The Nativity of the Lord") and Les corps glorieux ("The glorious bodies"). At the outbreak of World War II, Messiaen was drafted into the French army. Due to poor eyesight, he was enlisted as a medical auxiliary rather than an active combatant. He was captured at Verdun and taken to Görlitz in May 1940, and was imprisoned at Stalag VIII-A. He met a violinist, a cellist and a clarinettist among his fellow prisoners. He wrote a trio for them, which he gradually incorporated into his Quatuor pour la fin du temps ("Quartet for the End of Time"). The Quartet was first performed in January 1941 to an audience of prisoners and prison guards, with the composer playing a poorly maintained upright piano in freezing conditions. Thus the enforced introspection and reflection of camp life bore fruit in one of 20th-century classical music's acknowledged masterpieces. The title's "end of time" alludes to the Apocalypse, and also to the way that Messiaen, through rhythm and harmony, used time in a manner completely different from his predecessors and contemporaries. The idea of a European Centre of Education and Culture "Meeting Point Music Messiaen" on the site of Stalag VIII-A, for children and youth, artists, musicians and everyone in the region emerged in December 2004, was developed with the involvement of Messiaen's widow as a joint project between the council districts in Germany and Poland, and was finally completed in 2014. Shortly after his release from Görlitz in May 1941, Messiaen was appointed a professor of harmony at the Paris Conservatoire, where he taught until his retirement in 1978. He compiled his Technique de mon langage musical ("Technique of my musical language") published in 1944, in which he quotes many examples from his music, particularly the Quartet. Although only in his mid-thirties, his students described him as an outstanding teacher. Among his early students were the composers Pierre Boulez and Karel Goeyvaerts. Other pupils included Karlheinz Stockhausen in 1952, Alexander Goehr in 1956–57, Tristan Murail in 1967–72 and George Benjamin during the late 1970s. The Greek composer Iannis Xenakis was referred to him in 1951; Messiaen urged Xenakis to take advantage of his background in mathematics and architecture in his music. In 1943, Messiaen wrote Visions de l'Amen ("Visions of the Amen") for two pianos for Yvonne Loriod and himself to perform. Shortly thereafter he composed the enormous solo piano cycle Vingt regards sur l'enfant-Jésus ("Twenty gazes upon the child Jesus") for her. Again for Loriod, he wrote Trois petites liturgies de la présence divine ("Three small liturgies of the Divine Presence") for female chorus and orchestra, which includes a difficult solo piano part. Two years after Visions de l'Amen, Messiaen composed the song cycle Harawi, the first of three works inspired by the legend of Tristan and Isolde. The second of these works about human (as opposed to divine) love was the result of a commission from Serge Koussevitzky. Messiaen stated that the commission did not specify the length of the work or the size of the orchestra. This was the ten-movement Turangalîla-Symphonie. It is not a conventional symphony, but rather an extended meditation on the joy of human union and love. It does not contain the sexual guilt inherent in Richard Wagner's Tristan und Isolde because Messiaen believed that sexual love is a divine gift. The third piece inspired by the Tristan myth was Cinq rechants for twelve unaccompanied singers, described by Messiaen as influenced by the alba of the troubadours. Messiaen visited the United States in 1949, where his music was conducted by Koussevitsky and Leopold Stokowski. His Turangalîla-Symphonie was first performed in the US in 1949, conducted by Leonard Bernstein. Messiaen taught an analysis class at the Paris Conservatoire. In 1947 he taught (and performed with Loriod) for two weeks in Budapest. In 1949 he taught at Tanglewood. Beginning in summer 1949 he taught in the new music summer school classes at Darmstadt. While he did not employ the twelve-tone technique, after three years teaching analysis of twelve-tone scores, including works by Arnold Schoenberg, he experimented with ways of making scales of other elements (including duration, articulation and dynamics) analogous to the chromatic pitch scale. The results of these innovations was the "Mode de valeurs et d'intensités" for piano (from the Quatre études de rythme) which has been misleadingly described as the first work of "total serialism". It had a large influence on the earliest European serial composers, including Pierre Boulez and Karlheinz Stockhausen. During this period he also experimented with musique concrète, music for recorded sounds. When in 1952 Messiaen was asked to provide a test piece for flautists at the Paris Conservatoire, he composed the piece Le merle noir for flute and piano. While he had long been fascinated by birdsong, and birds had made appearances in several of his earlier works (for example La Nativité, Quatuor and Vingt regards), the flute piece was based entirely on the song of the blackbird. He took this development to a new level with his 1953 orchestral work Réveil des oiseaux—its material consists almost entirely of the birdsong one might hear between midnight and noon in the Jura. From this period onwards, Messiaen incorporated birdsong into all of his compositions and composed several works for which birds provide both the title and subject matter (for example the collection of thirteen pieces for piano Catalogue d'oiseaux completed in 1958, and La fauvette des jardins of 1971). Paul Griffiths observed that Messiaen was a more conscientious ornithologist than any previous composer, and a more musical observer of birdsong than any previous ornithologist. The garden warbler provided the title and much of the material for Messiaen's La fauvette des jardins. Messiaen's first wife died in 1959 after a long illness, and in 1961 he married Loriod. He began to travel widely, to attend musical events and to seek out and transcribe the songs of more exotic birds in the wild. Loriod frequently assisted her husband's detailed studies of birdsong while walking with him, by making tape recordings for later reference. In 1962 he visited Japan, where Gagaku music and Noh theatre inspired the orchestral "Japanese sketches", Sept haïkaï, which contain stylised imitations of traditional Japanese instruments. Messiaen's music was by this time championed by, among others, Pierre Boulez, who programmed first performances at his Domaine musical concerts and the Donaueschingen festival. Works performed included Réveil des oiseaux, Chronochromie (commissioned for the 1960 festival) and Couleurs de la cité céleste. 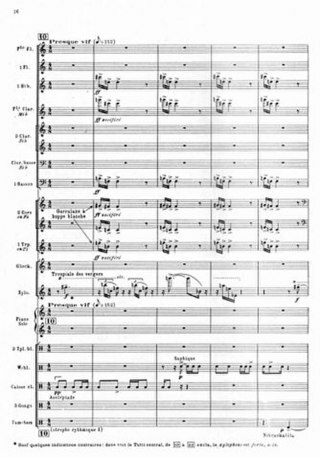 The latter piece was the result of a commission for a composition for three trombones and three xylophones; Messiaen added to this more brass, wind, percussion and piano, and specified a xylophone, xylorimba and marimba rather than three xylophones. Another work of this period, Et exspecto resurrectionem mortuorum, was commissioned as a commemoration of the dead of the two World Wars and was performed first semi-privately in the Sainte-Chapelle, then publicly in Chartres Cathedral with Charles de Gaulle in the audience. His reputation as a composer continued to grow and in 1959, he was nominated as an Officier of the Légion d'honneur. In 1966 he was officially appointed professor of composition at the Paris Conservatoire, although he had in effect been teaching composition for years. Further honours included election to the Institut de France in 1967 and the Académie des beaux-arts in 1968, the Erasmus Prize in 1971, the award of the Royal Philharmonic Society Gold Medal and the Ernst von Siemens Music Prize in 1975, the Sonning Award (Denmark's highest musical honour) in 1977, the Wolf Prize in Arts in 1982, and the presentation of the Croix de Commander of the Belgian Order of the Crown in 1980. Messiaen's next work was the large-scale La Transfiguration de Notre Seigneur Jésus-Christ. The composition occupied him from 1965 to 1969 and the musicians employed include a 100-voice ten-part choir, seven solo instruments and large orchestra. Its fourteen movements are a meditation on the story of Christ's Transfiguration. Shortly after its completion, Messiaen received a commission from Alice Tully for a work to celebrate the U.S. bicentennial. He arranged a visit to the US in spring 1972, and was inspired by Bryce Canyon in Utah, where he observed the canyon's distinctive colours and birdsong. The twelve-movement orchestral piece Des canyons aux étoiles... was the result, first performed in 1974 in New York. In 1971, he was asked to compose a piece for the Paris Opéra. While reluctant to undertake such a major project, he was persuaded in 1975 to accept the commission and began work on his Saint-François d'Assise. The composition was intensive (he also wrote his own libretto) and occupied him from 1975 to 1979; the orchestration was carried out from 1979 until 1983. Messiaen preferred to describe the final work as a "spectacle" rather than an opera. It was first performed in 1983. Some commentators at the time thought that the opera would be his valediction (at times Messiaen himself believed so), but he continued to compose. In 1984 he published a major collection of organ pieces, Livre du Saint Sacrement; other works include birdsong pieces for solo piano, and works for piano with orchestra. In the summer of 1978, Messiaen retired from teaching at the Conservatoire. He was promoted to the highest rank of the Légion d'honneur, the Grand-Croix, in 1987. An operation prevented his participation in the celebration of his 70th birthday in 1978, but in 1988 tributes for Messiaen's 80th included a complete performance in London's Royal Festival Hall of St. François, which the composer attended, and Erato's publication of a seventeen-CD collection of Messiaen's music including a disc of the composer in conversation with Claude Samuel. Although in considerable pain near the end of his life (requiring repeated surgery on his back) he was able to fulfil a commission from the New York Philharmonic Orchestra, Éclairs sur l'au-delà..., which was premièred six months after his death. He died in Paris on April 27, 1992. On going through his papers, Loriod discovered that, in the last months of his life, he had been composing a concerto for four musicians he felt particularly grateful to, namely herself, the cellist Mstislav Rostropovich, the oboist Heinz Holliger and the flautist Catherine Cantin (hence the title Concert à quatre). Four of the five intended movements were substantially complete; Yvonne Loriod undertook the orchestration of the second half of the first movement and of the whole of the fourth with advice from George Benjamin. It was premiered by the dedicatees in September 1994. Messiaen's music has been described as outside the western musical tradition, although growing out of that tradition and being influenced by it. Much of his output denies the western conventions of forward motion, development and diatonic harmonic resolution. This is partly due to the symmetries of his technique—for instance the modes of limited transposition do not admit the conventional cadences found in western classical music. Example 1. A page from Oiseaux exotiques. It illustrates Messiaen's use of ancient and exotic rhythms (in the percussion near the bottom of the score "Asclepiad" and "Sapphic" are ancient Greek rhythms, and Nibçankalîla is a decî-tâla from Śārṅgadeva). It also illustrates Messiaen's precision in notating birdsong: the birds identified here are the white-crested laughing thrush (garralaxe à huppe blanche) in the brass and wind instruments, and the orchard oriole (troupiale des vergers) played on the xylophone. His youthful love for the fairy-tale element in Shakespeare prefigured his later expressions of Catholic liturgy. Messiaen was not interested in depicting aspects of theology such as sin; rather he concentrated on the theology of joy, divine love and redemption. Messiaen continually evolved new composition techniques, always integrating them into his existing musical style; his final works still retain the use of modes of limited transposition. For many commentators this continual development made every major work from the Quatuor onwards a conscious summation of all that Messiaen had composed up to that time. However, very few of these major works lack new technical ideas—simple examples being the introduction of communicable language in Meditations, the invention of a new percussion instrument (the geophone) for Des canyons aux etoiles..., and the freedom from any synchronisation with the main pulse of individual parts in certain birdsong episodes of St. François d'Assise. As well as discovering new techniques, Messiaen found and absorbed exotic music, including Ancient Greek rhythms, Hindu rhythms (he encountered Śārṅgadeva's list of 120 rhythmic units, the deçî-tâlas), Balinese and Javanese Gamelan, birdsong, and Japanese music (see Example 1 for an instance of his use of ancient Greek and Hindu rhythms). While he was instrumental in the academic exploration of his techniques (he compiled two treatises: the later one in five volumes was substantially complete when he died and was published posthumously), and was himself a master of music analysis, he considered the development and study of techniques a means to intellectual, aesthetic, and emotional ends. Thus Messiaen maintained that a musical composition must be measured against three separate criteria: it must be interesting, beautiful to listen to, and it must touch the listener. Messiaen wrote a large body of music for the piano. Although a considerable pianist himself, he was undoubtedly assisted by Yvonne Loriod's formidable piano technique and ability to convey complex rhythms and rhythmic combinations; in his piano writing from Visions de l'Amen onwards he had her in mind. Messiaen said, "I am able to allow myself the greatest eccentricities because to her anything is possible." Developments in modern French music were a major influence on Messiaen, particularly the music of Claude Debussy and his use of the whole-tone scale (which Messiaen called Mode 1 in his modes of limited transposition). Messiaen rarely used the whole-tone scale in his compositions because, he said, after Debussy and Dukas there was "nothing to add", but the modes he did use are all similarly symmetrical. Messiaen had a great admiration for the music of Igor Stravinsky, particularly the use of rhythm in earlier works such as The Rite of Spring, and his use of orchestral colour. He was further influenced by the orchestral brilliance of Heitor Villa-Lobos, who lived in Paris in the 1920s and gave acclaimed concerts there. Among composers for the keyboard, Messiaen singled out Jean-Philippe Rameau, Domenico Scarlatti, Frédéric Chopin, Debussy and Isaac Albéniz. He loved the music of Modest Mussorgsky and incorporated varied modifications of what he called the "M-shaped" melodic motif from Mussorgsky's Boris Godunov, although he modified the final interval in this motif from a perfect fourth to a tritone (Example 3). 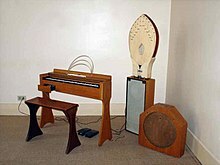 Messiaen was further influenced by Surrealism, as may be seen from the titles of some of the piano Préludes (Un reflet dans le vent..., "A reflection in the wind") and in some of the imagery of his poetry (he published poems as prefaces to certain works, for example Les offrandes oubliées). Colour lies at the heart of Messiaen's music. He believed that terms such as "tonal", "modal" and "serial" are misleading analytical conveniences. For him there were no modal, tonal or serial compositions, only music with or without colour. He said that Claudio Monteverdi, Mozart, Chopin, Richard Wagner, Mussorgsky and Stravinsky all wrote strongly coloured music. In some of Messiaen's scores, he notated the colours in the music (notably in Couleurs de la cité céleste and Des canyons aux étoiles...)—the purpose being to aid the conductor in interpretation rather than to specify which colours the listener should experience. The importance of colour is linked to Messiaen's synaesthesia, which he said caused him to experience colours when he heard or imagined music (he said that he did not perceive the colours visually). In his multi-volume music theory treatise Traité de rythme, de couleur, et d'ornithologie ("Treatise of Rhythm, Colour and Birdsong"), Messiaen wrote descriptions of the colours of certain chords. His descriptions range from the simple ("gold and brown") to the highly detailed ("blue-violet rocks, speckled with little grey cubes, cobalt blue, deep Prussian blue, highlighted by a bit of violet-purple, gold, red, ruby, and stars of mauve, black and white. Blue-violet is dominant"). When asked what Messiaen's main influence had been on composers, George Benjamin said, "I think the sheer ... colour has been so influential, ... rather than being a decorative element, [Messiaen showed that colour] could be a structural, a fundamental element, ... the fundamental material of the music itself." Example 2. The first bar of the piano Prélude, Instants défunts. An early example of Messiaen's use of palindromic rhythms (which he called non-retrogradable rhythms). From his earliest works, Messiaen used non-retrogradable (palindromic) rhythms (Example 2). He sometimes combined rhythms with harmonic sequences in such a way that, if the process were repeated indefinitely, the music would eventually run through all possible permutations and return to its starting point. For Messiaen, this represented the "charm of impossibilities" of these processes. He only ever presented a portion of any such process, as if allowing the informed listener a glimpse of something eternal. In the first movement of Quatuor pour la fin du temps the piano and cello together provide an early example. Messiaen used modes he called modes of limited transposition. They are distinguished as groups of notes that can only be transposed by a semitone a limited number of times. For example, the whole-tone scale (Messiaen's Mode 1) only exists in two transpositions: namely C–D–E–F♯–G♯–A♯ and D♭–E♭–F–G–A–B. Messiaen abstracted these modes from the harmony of his improvisations and early works. Music written using the modes avoids conventional diatonic harmonic progressions, since for example Messiaen's Mode 2 (identical to the octatonic scale used also by other composers) permits precisely the dominant seventh chords whose tonic the mode does not contain. Example 3. An excerpt from Danse de la fureur, pour les sept trompettes from the Quatuor pour la fin du temps. It illustrates Messiaen's use of additive rhythms—in this example the addition of unpaired semiquavers (sixteenth notes) to an underlying quaver (eighth note) pulse and the lengthening of the final quaver by addition of a dot. It illustrates the use of what Messiaen called the Boris M-shaped motif (the last five notes of the excerpt). As well as making use of non-retrogradable rhythm and the Hindu decî-tâlas, Messiaen also composed with "additive" rhythms. This involves lengthening individual notes slightly or interpolating a short note into an otherwise regular rhythm (see Example 3), or shortening or lengthening every note of a rhythm by the same duration (adding a semiquaver to every note in a rhythm on its repeat, for example). This led Messiaen to use rhythmic cells that irregularly alternate between two and three units, a process that also occurs in Stravinsky's The Rite of Spring, which Messiaen admired. listen (help·info)), which is built from, in Messiaen's words, "64 chromatic durations from 1 to 64 demisemiquavers [thirty-second notes]—invested in groups of 4, from the ends to the centre, forwards and backwards alternately—treated as a retrograde canon. The whole peopled with birdsong." Example 4. The song of the golden oriole from Le loriot, part of Catalogue d'oiseaux. The birdsong played by the pianist's left hand (notated on the lower staff) provides the fundamental notes, and the quieter harmonies played by the right hand (on the upper staff) alter their timbre. In addition to making harmonic use of the modes of limited transposition, he cited the harmonic series as a physical phenomenon that provides chords with a context he felt was missing in purely serial music. An example of Messiaen's harmonic use of this phenomenon, which he called "resonance", is the last two bars of his first piano Prélude, La colombe ("The dove"): the chord is built from harmonics of the fundamental base note E.
Related to this use of resonance, Messiaen also composed music in which the lowest, or fundamental, note is combined with higher notes or chords played much more quietly. These higher notes, far from being perceived as conventional harmony, function as harmonics that alter the timbre of the fundamental note like mixture stops on a pipe organ. An example is the song of the golden oriole in Le loriot of the Catalogue d'oiseaux for solo piano (Example 4). Birdsong fascinated Messiaen from an early age, and in this he found encouragement from his teacher Dukas, who reportedly urged his pupils to "listen to the birds". Messiaen included stylised birdsong in some of his early compositions (including L'abîme d'oiseaux from the Quatuor pour la fin du temps), integrating it into his sound-world by techniques like the modes of limited transposition and chord colouration. His evocations of birdsong became increasingly sophisticated, and with Le réveil des oiseaux this process reached maturity, the whole piece being built from birdsong: in effect it is a dawn chorus for orchestra. The same can be said for "Epode", the five-minute sixth movement of Chronochromie, which is scored for eighteen violins, each one playing a different birdsong. Messiaen notated the bird species with the music in the score (examples 1 and 4). The pieces are not simple transcriptions; even the works with purely bird-inspired titles, such as Catalogue d'oiseaux and Fauvette des jardins, are tone poems evoking the landscape, its colours and atmosphere. For some compositions, Messiaen created scales for duration, attack and timbre analogous to the chromatic pitch scale. He expressed annoyance at the historical importance given to one of these works, Mode de valeurs et d'intensités, by musicologists intent on crediting him with the invention of "total serialism". Messiaen later introduced what he called a "communicable language", a "musical alphabet" to encode sentences. He first used this technique in his Méditations sur le mystère de la Sainte Trinité for organ; where the "alphabet" includes motifs for the concepts to have, to be and God, while the sentences encoded feature sections from the writings of St. Thomas Aquinas. ^ Griffiths, Paul (20 January 2001). "Messiaen, Olivier (Eugène Prosper Charles)". Oxford Music Online. doi:10.1093/gmo/9781561592630.article.18497. ^ Griffiths & Nichols 2002. ^ Hill & Simeone 2005, p. 7. ^ Christopher Dingle, The Life of Messiaen(London: Cambridge University Press, 2007), 7. ^ "European Center of Education and Culture". ^ Messiaen's visit to Japan is documented in Hill & Simeone (2005), pp. 245–251, and there is a more technical discussion in Griffiths (1985), pp. 197–200. Malcolm Troup, writing in Hill (1995), additionally notes the direct influence of Noh theatre on aspects of Messiaen's opera St François d'Assise. ^ "Messiaen Edition". ArkivMusic. Retrieved September 8, 2013. ^ "Olivier Messiaen". Schott Music. Archived from the original on September 8, 2013. Retrieved September 8, 2013. ^ Bruhn, Siglind; Deely, John (January 1996). "Religious Symbolism in the Music of Olivier Messiaen". The American Journal of Semiotics. 13 (1): 277–309. doi:10.5840/ajs1996131/412. ^ See for instance Griffiths (1985), p. 233, "[Des canyons aux étoiles...] is therefore not so much a synthesis, as has sometimes been suggested, but more a step into the future that also joins the circle with the composer's past." ^ Coleman, John (November 24, 2008). "Maestro of Joy". America: the National Catholic Review. Retrieved September 8, 2013. ^ See Messiaen, Olivier Traité de rythme, de couleur, et d'ornithologie. See also Bernard, Jonathan W. (1986). "Messiaen's Synaesthesia: The Correspondence between Color and Sound Structure in His Music." Music Perception 4: 41–68..
^ George Benjamin, speaking in interview with Tommy Pearson, broadcast on BBC4 in the interval of Prom concert in 2004 at which Benjamin conducted a performance of Des canyons aux étoiles... Asked what made Messiaen so influential he said, "I think the sheer—the word he loved—colour has been so influential. People, composers, have found that colour, rather than being a decorative element, could be a structural, a fundamental element. And not colour just in a surface way, not just in the way you orchestrate it—no—the fundamental material of the music itself. More than that I can't say except that for my own small world he was incredibly important, and an exceptionally special and indeed wonderful person. I met him when I was very young (I was 16) and stayed closely in touch with him until he died in 1992, and was immensely fond of him..."
^ Benitez, Vincent (July 2009). "Reconsidering Messiaen as Serialist". Music Analysis. 28 (2–3): 267–299. doi:10.1111/j.1468-2249.2011.00293.x. ^ Benitez, Vincent (April 2004). "Aspects of Harmony in Messiaen's Later Music: An Examination of the Chords of Transposed Inversions on the Same Bass Note". Journal of Musicological Research. 23 (2): 187–226. doi:10.1080/01411890490449781. ^ Bruhn, Siglind (2008). "Traces of a Thomistic De musica in the Compositions of Olivier Messiaen". Logos. 11 (4): 16–56. ^ For extensive discussion of the use of birdsong in Messiaen's work, see Kraft (2013). Bannister, Peter (2013). "Olivier Messiaen (1908–1992)". In Anderson, Christopher S. Twentieth-century organ music. New York: Routledge. ISBN 9781136497902. Bruhn, Siglind (2008a). Messiaen's Interpretations of Holiness and Trinity. Echoes of Medieval Theology in the Oratorio, Organ Meditations, and Opera. Hillsdale, NY: Pendragon Press. ISBN 978-1-57647-139-5. Bruhn, Siglind (2008b). Messiaen's Explorations of Love and Death. Musico-poetic Signification in the Tristan Trilogy and Three Related Song Cycles. Hillsdale, NY: Pendragon Press. ISBN 978-1-57647-136-4. Griffiths, Paul (2001). "Messiaen, Olivier (Eugène Prosper Charles)". In Sadie, Stanley; Tyrrell, John. The New Grove Dictionary of Music and Musicians (second ed.). London: Macmillan Publishers. Griffiths, Paul; Nichols, Roger (2002). "Messiaen, Olivier (Eugène Prosper Charles)". In Latham. The Oxford Companion to Music (new ed.). Oxford and New York: Oxford University Press. ISBN 9780198662129. Heller, Karin (2010). "Olivier Messiaen and Cardinal Jean-Marie Lustiger". In Shenton, Andrew. Messiaen the theologian. Farnham: Ashgate. ISBN 9780754666400. Hill, Peter, ed. (1995). The Messiaen Companion. London: Faber and Faber. ISBN 0-571-17033-1. Hill, Peter; Simeone, Nigel (2005). Messiaen. New Haven and London: Yale University Press. ISBN 0-300-10907-5. Simeone, Nigel (2009). "'Un oeuvre simple, solennelle...'". In Shenton, Andrew. Messiaen the theologian. Farnham: Ashgate. ISBN 9780754666400. Baggech, Melody Ann (1998). An English Translation of Olivier Messiaen's "Traite de Rythme, de Couleur, et d'Ornithologie" Norman: The University of Oklahoma. Benitez, Vincent P. (2000). "A Creative Legacy: Messiaen as Teacher of Analysis". College Music Symposium. 40 (2000): 117–39. JSTOR 40374403. Bruhn, Siglind (Jul 7, 2008). Messiaen's Interpretations of Holiness and Trinity: Echoes of Medieval Theology in the Oratorio, Organ Meditations, and Opera. Dimension & diversity, no. 10. (1st ed.). Hillsdale, NY: Pendragon Press. p. 229. ISBN 978-1576471395. OCLC 227191541. Burns, Jeffrey Phillips (1995). "Messiaen's Modes of Limited Transposition Reconsidered". M.M. thesis, Madison: University of Wisconsin-Madison. Wikimedia Commons has media related to Olivier Messiaen. oliviermessiaen.net, hosted by the Boston University Messiaen Project [BUMP]. Includes detailed information on the composer's life and works, events, and links to other Messiaen websites. www.philharmonia.co.uk/messiaen, the Philharmonia Orchestra's Messiaen website. The site contains articles, unseen images, programme notes and films to go alongside the orchestra's series of concerts celebrating the Centenary of Olivier Messiaen's birth. David Schiff, Music for the End of Time, The Nation, posted January 25, 2006 (February 13, 2006 issue). Formally a review of Messiaen by Peter Hill and Nigel Simeone, but provides an overview of Messiaen's life and works. "Olivier Messiaen biography" (in French). IRCAM. Excerpts from sound archives of Messiaen's works.